A view from the Tandem airship during its record-breaking flight on Oct. 22. Crewed stations floating high above the Earth with huge balloons could someday act as waypoints for human astronauts headed into space. 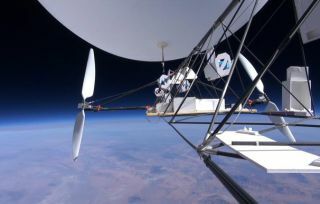 That's the vision of a DIY space program that has smashed world altitude records by sending a drone airship flying up 18 miles into the sky. The Tandem airship soared almost four miles higher than any past airships during its record-breaking flight on the morning of Oct. 22. Its flight to 95,085 feet above Nevada's Black Rock desert marks a first step toward plans for an "Airship to Orbit" program that would fly humans into space using existing technology. "The big aerospace firms have been trying to do this for decades, spending hundreds of millions of dollars," said John Powell, president of JP Aerospace. "We've spent about $30,000 and the past five years developing Tandem." Tandem vaguely resembles a skeletal airplane similar to the Wright Brothers' aircraft, but its lifting power comes from twin balloons located on a 30-foot-long (9 meters) carbon fiber truss. Two electric motors spin six-foot-long propellers designed to work well in the thin atmosphere 20 miles up. During the flight test, a pilot on the ground remotely switched on the airship's motors and flew the Tandem through different maneuvers. One balloon burst at the end of the mission, and airship released its other balloon before coming back down to Earth by using five parachutes. The Airship to Orbit program envisions a bigger airship capable of taking a crew of three with passengers or cargo up to 27 miles (43 kilometers) above the Earth. Such a craft would combine airship buoyancy and aerodynamic lift by having a long "V" shape for its body, along with propellers capable of operating in the near-vacuum high above the Earth. JP Aerospace has also begun flight-testing small models of so-called "Dark Sky Stations" that would act as suborbital space stations. The stations, supported by balloons, could eventually reach a size 2 miles wide and act as the middle waypoint for the atmospheric airship. Such stations could also act as construction sites for another airship vehicle designed to take humans on the final leg of the voyage from sky to space. A first test vehicle more than a mile long would climb almost 38 miles up based on airship buoyancy, before using an ion engine's electric propulsion to slowly accelerate and reach escape velocity over five days. An undated document posted on the JP Aerospace website lists the first crewed station flight scheduled within 18 months, and an ion engine flight test within the next five months. It also estimates a completion date sometime within seven years. The DIY space program has paid its way so far based on small, incremental funding. For instance, it has funded its atmospheric airship design by pitching it to the U.S. Department of Defense for use as a reconnaissance vehicle. "This new way to space has not and will not require a massive pile of capital to accomplish," according to JP Aerospace. "Each component has its own business application and funding source. It is a pay-as-you-go system."